A gorgeous night in Los Angeles with an event designed to get people to look up, look down, look all around! 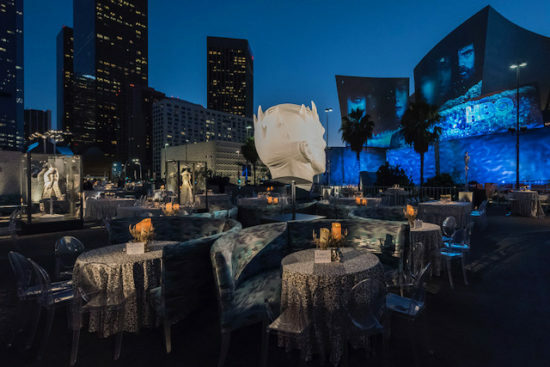 The annual LA Philharmonic Gala is held at the Walt Disney Concert Hall with cocktails inside and dinner in a tented space off the world-class venue. This year, neon lighting sculptures from Nights of Neon were used in conjunction with traditional lighting from our lighting team. Led by our lighting designer Lonnie Thompson, the look featured lighting textures layered over the space — on the floors, tables and perimeter. The entire look was about seeing what is there, and what isn’t there. 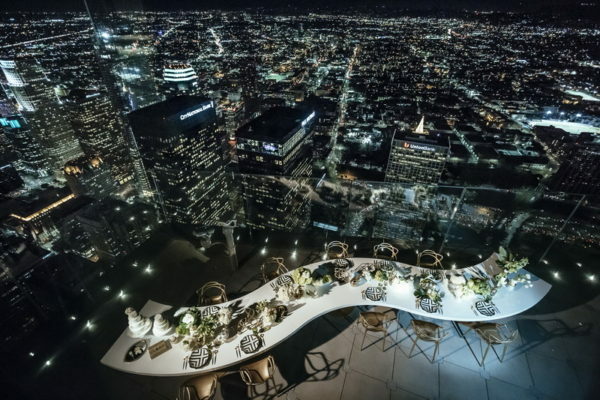 A tent that wasn’t there so the skyline of Los Angeles came into view, chairs that one could see through and neon sculpture inspired by the sound of music. Speaking of vision, it’s 20-20 in hindsight so let’s go back and show you how we got here! Sub flooring is in, tent structure is up. Blue tarp over the entire tent top kept the space from getting too hot. Central truss, covered for design appeal, goes in. Nights of Neon installing the main light art sculpture. All elements inside and ready be placed. Once they are, our crew is up again on ladders to focus the pinspots. 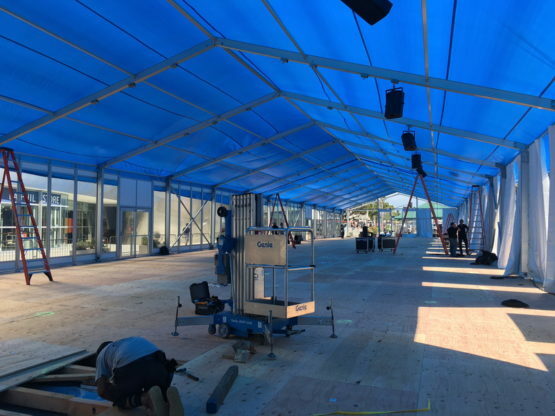 Finishing touches outside the tent space. This year’s star-studded HBO Emmy Awards after party and its inspired design proves that event designers and their work improve over time. 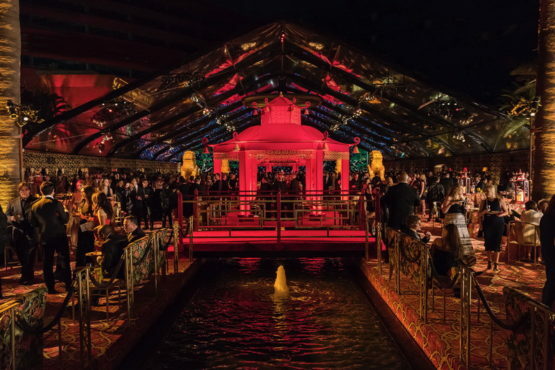 Clearly, there is no slowing down for designer Billy Butchkavitz who along with his HBO collaborator Cindy Tenner, HBO’s vice president of special events, and a loyal team of creative partners, have designed the event for the past 19 consecutive years. 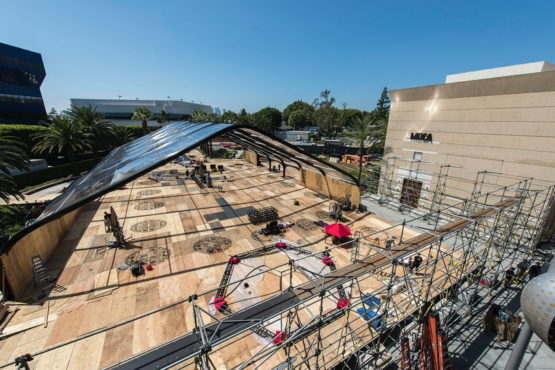 While the first event were held at various venues, for the past 15 of those years the event has been held in a custom tent installed over the fountains at the Pacific Design Center. Once again, Butchkavitz challenged himself and his team with another unique and exciting theme; this time inspired by the Royal Pavilion in Brighton, England. The palace, a seaside “resort” built for King George IV, was started in 1787 and was added onto through 1822, is an exotic addition to the English seaside town. Its interior is an homage to chinoiserie – a blend of Asian and Europe decorative arts – while its exterior is a beautiful collage of domes and minarets. It’s effect on Butchkavitz has been great. “I’ve been going to the Royal Pavilion in Brighton for almost 30 years,” Butchkavitz said. “I’ve been waiting for the right time to do an event based on the interior design of this magnificent palace.” This was his moment to do so. 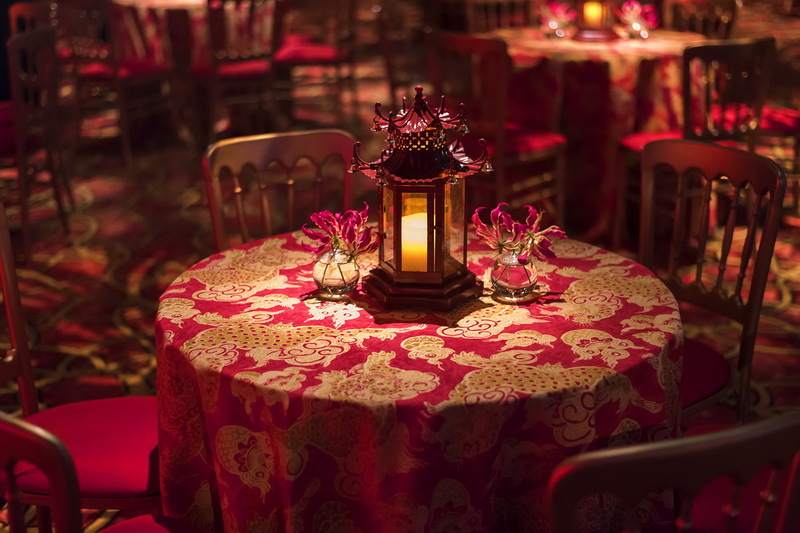 In true Butchkavitz style, a multitude of custom textiles, furniture, tabletop decor, and carpeting were artfully combined to match the pavilion’s chinoiserie interiors. 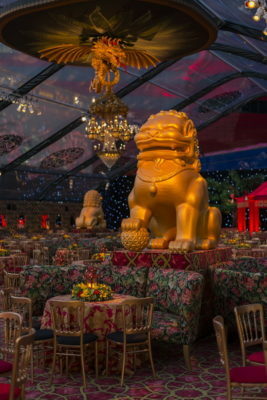 A series of 12-foot Chinese guardian lions stood in the main dining pavilion, and a 30-foot tiered pagoda surrounded by giant jade trees served as the entertainment hub. 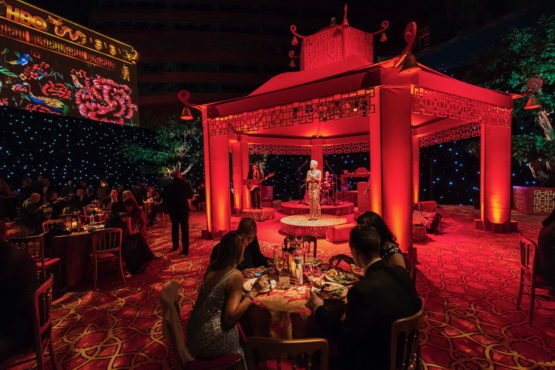 In front of the pagoda, guests could cross a garden pond over a 16-foot-long chinoiserie bridges. But it was when guests looked up that they glimpsed the true magnificence of the palace and its design style. 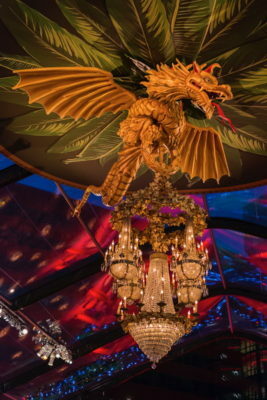 Butchkavitz had created a 20-foot-long replica of a show-stopping dragon chandelier that hangs in the Royal Pavilion’s banquet room. 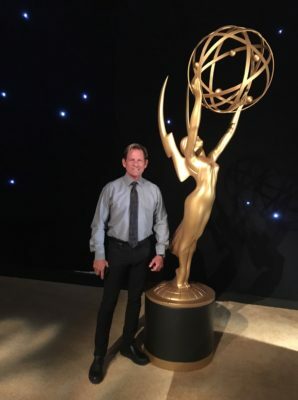 Just as the Royal Pavilion was produced by a longtime team, Butchkavitz called upon his team of creative partners, many of whom have been working with him on all 19 years of HBO Emmy parties. 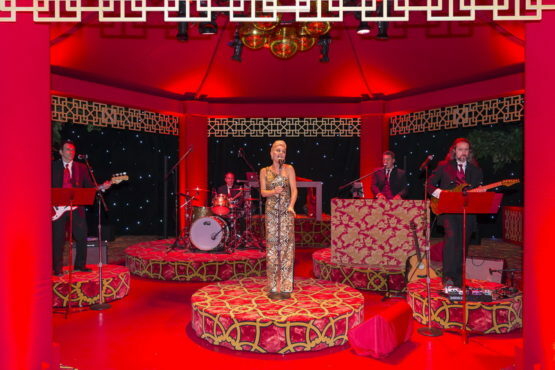 Agile Eye Solutions constructed the large-scale decor pieces, pagoda, custom tent skin embellishments, and the step-and-repeat. Our lighting designer Curt Stahl provided dramatic lighting while Bart Kresa Design projected artistic designs. 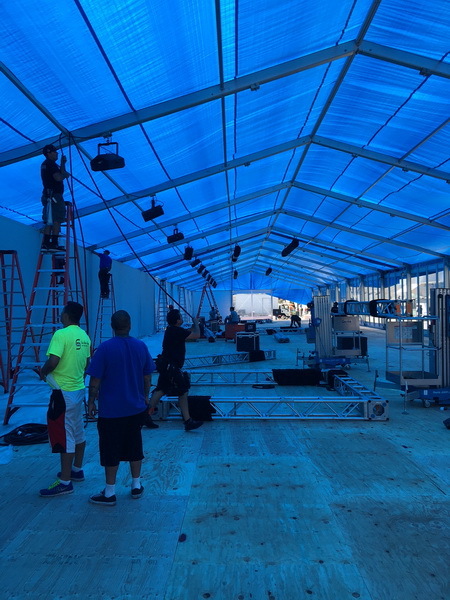 Special Event Contractors installed the elevated subfloors, perimeter walls, elevated walkways, and decorative railings. 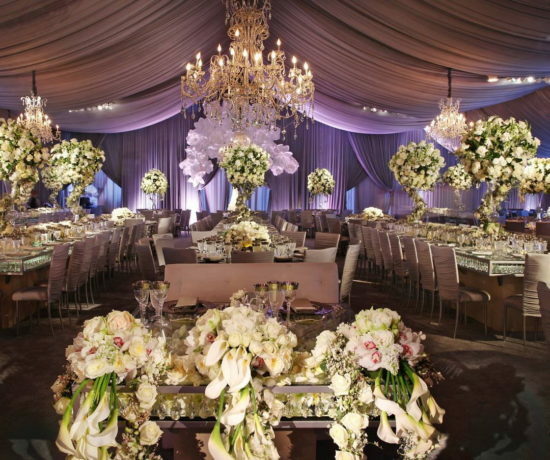 And Town & County Event Rentals provided the custom tent, carpeting and rentals. The history of the actual Royal Pavilion over the years includes parties, hospitals and flower shows, contains influences from China, India and France, and includes characters as diverse as fishermen, monarchs and soldiers. 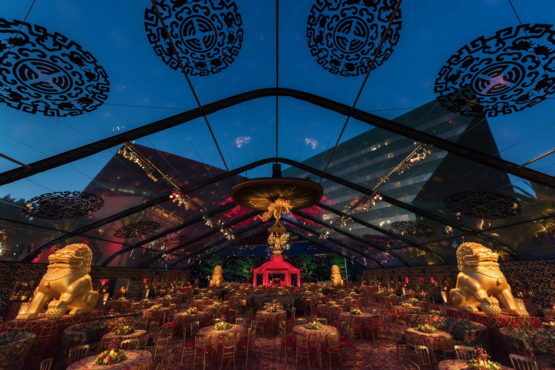 Given this, and its intricate design, Butchkavitz could not have chosen a more perfect theme for an HBO event — a media outlet that brings us stories from many exotic locales, and celebrates characters from humble to holy! 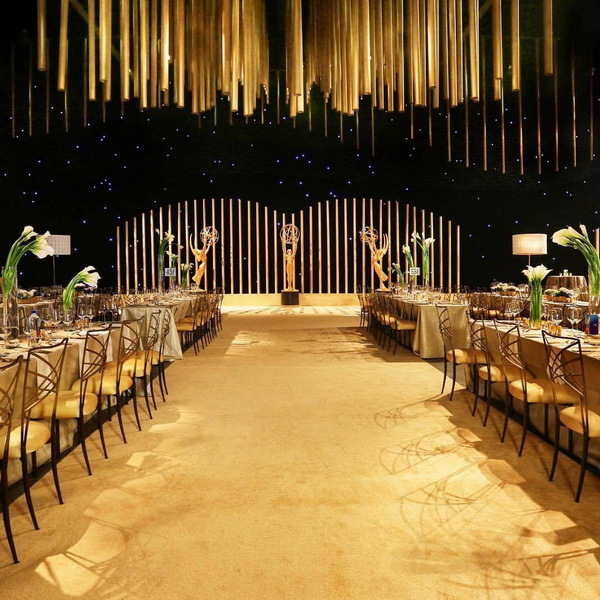 The theme of this year’s Governor Ball following the 69th Annual Emmy Awards was Golden Grandeur yet not all that glittered was gold. 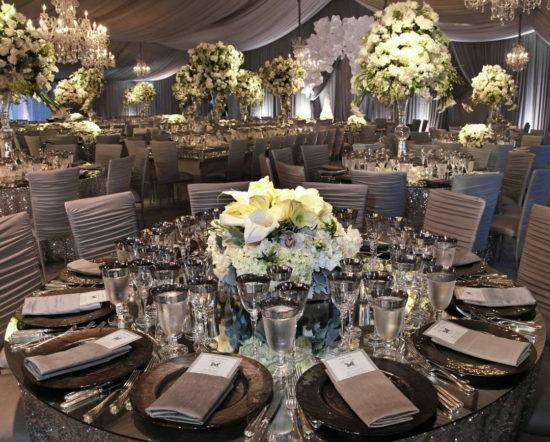 That’s because the event, which at 4,000 guest is one of the largest formal seated dinners in North America, and its producer for the past 20 years, Sequoia Productions, was committed to making as many of the evening’s elements sustainable and reusable. For instance, all food and debris was composted afterward, carpet was donated to Habitat for Humanity, rentals were reused, and all lights and fixtures were energy-efficient. It was awards lighting for the next generation. Inspired by the Emmy gold, the most dramatic element of the monochromatic design was sustainable as well. Five thousand tubes designed by Irma Hardjakusumah ranged from two to 20 feet in length. They were painstakingly installed vertically by Bill Ferrell Co. to create a sweeping wave effect in the ceiling of the Los Angeles Convention Center. But instead of made from metal or plastic, they were cylinders of paper painted in a biodegradable gold coloring. Our senior lighting designer Ray Thompson created a play of lighting that would add movement across the tubes, at times totally change their color to go with the mood and the music, and create emotional crescendos when the evening called for them. See video at the end of this post. We were proud to be part of this golden moment in awards lighting once again! 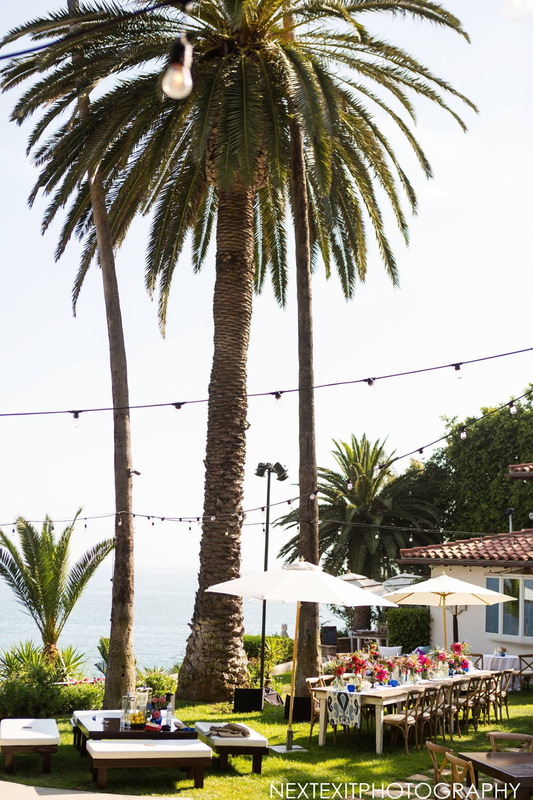 A picture perfect wedding this month in Malibu. 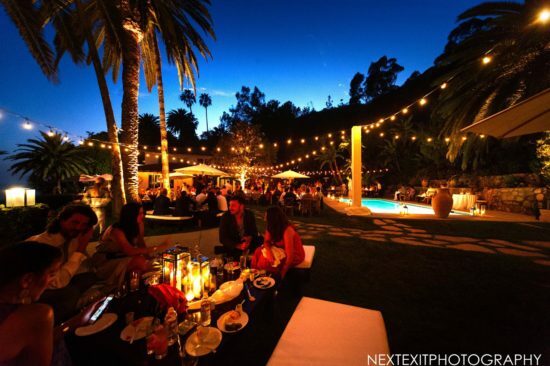 Wedding lighting entailed stringer lights for that California vibe, and landscape and architectural highlights. 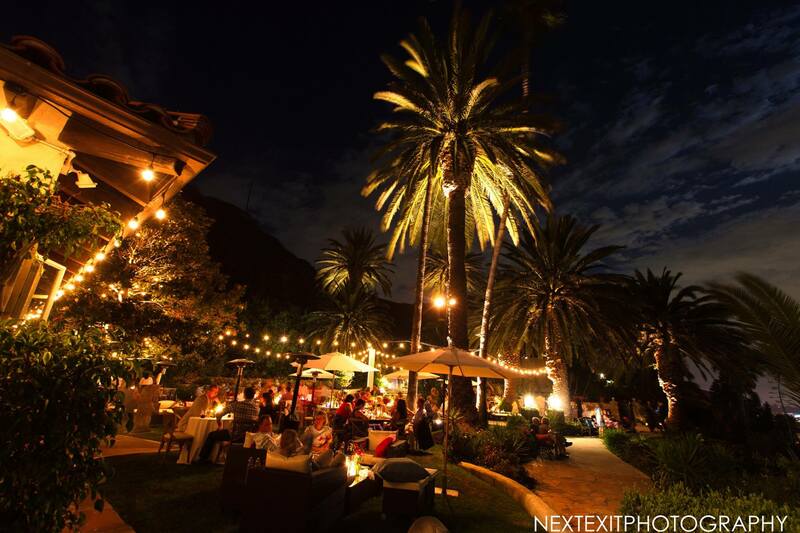 Loved the images by our friends at Next Exit Photography! 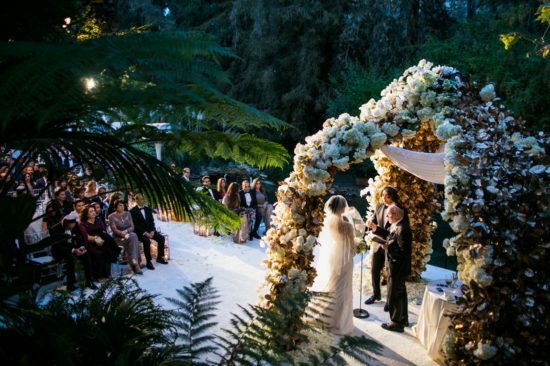 This sweet sophisticated summer wedding produced and designed by Alexandra Kolendrianos took advantage of a perfect summer setting — the lush garden area of the Hotel Bel-Air. 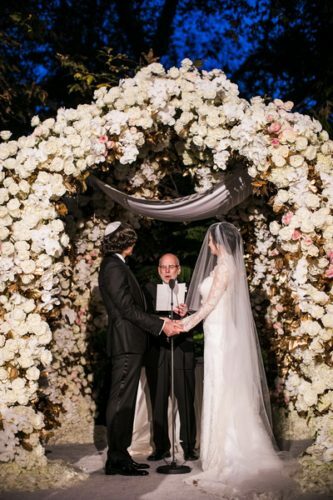 Before a backdrop of a floral chuppah designed by White Lilac Inc., these two lovebirds were wed while two other lovebirds — the hotel’s resident swans — floated by in the garden’s stream. 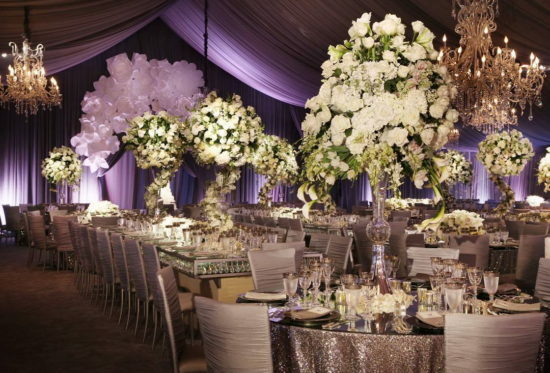 From the ceremony area, guests made their way into a tent set on the main grounds for dinner. 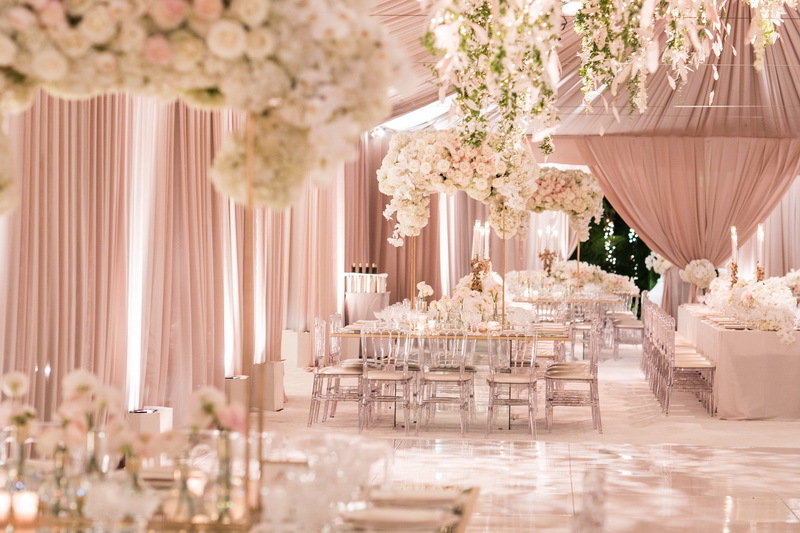 The interior was draped in blush chiffon. 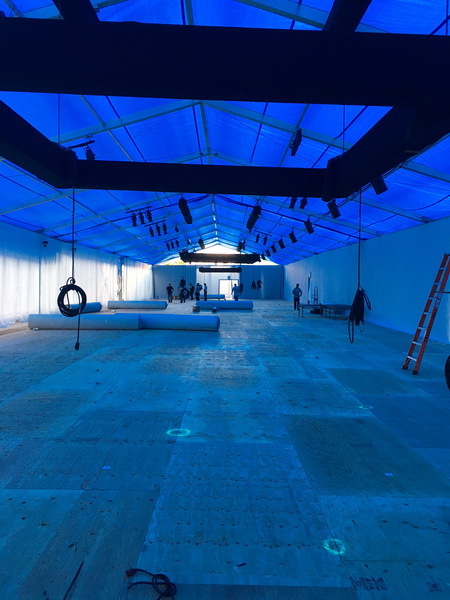 Our lighting design Lonnie Thompson and his team softly illuminated the perimeter and tent ceiling and finished the look with a white-on-white break up pattern on the dance floor. 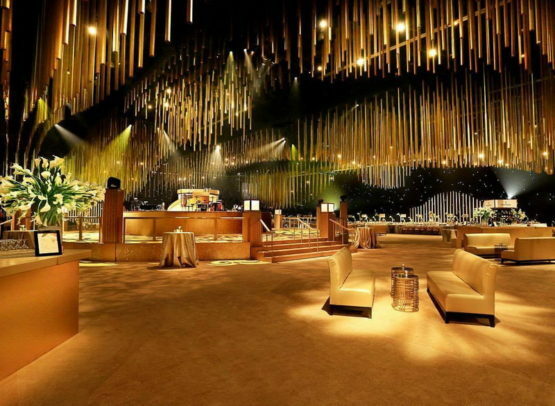 After dinner, the 200 guests moved into the ballroom for an after party. 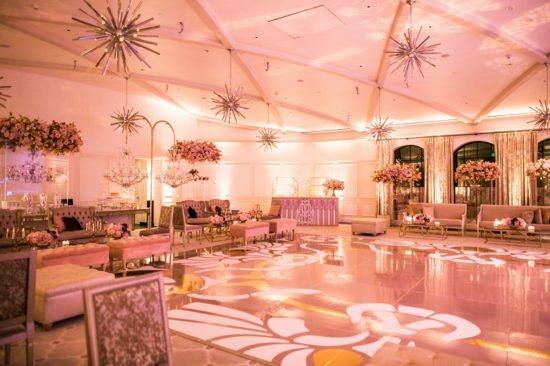 Once again, soft lighting — this time in amber and pink — gave the room a glow while incredible floral “chandeliers” provided their own design illumination! 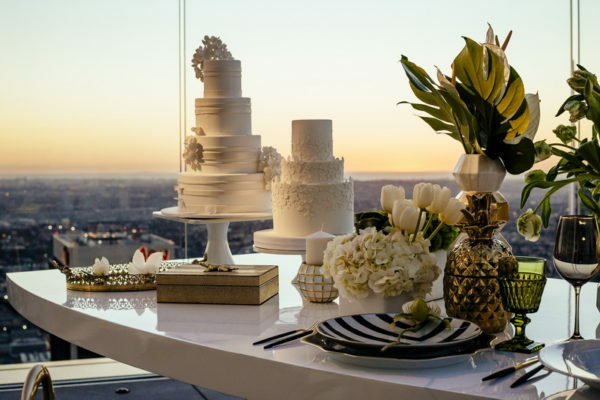 The three distinct looks were perfect for breaking up the evening into three memorable moments for all, but most importantly, for the wedding couple. Gaga Over This Wedding Lighting! No more waiting. We can confidently declare that this was the wedding of the year, 2017. 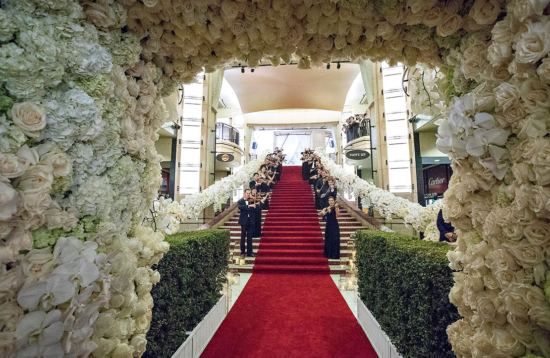 Produced by Mindy Weiss, designed by Edgar Zamora from Revelry Event Designers with thousands of flowers from Mark’s Garden, and lighting by Images by Lighting, the event took place at the Dolby Theatre at Hollywood & Highland; the same venue for the Oscars, on the same stage even. 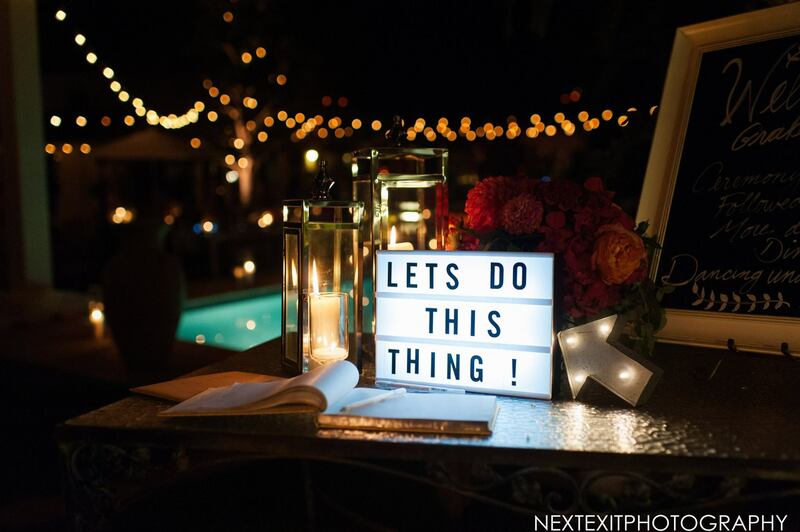 This should be your first clue as to the magnitude and scale of the event and the wedding lighting involved! 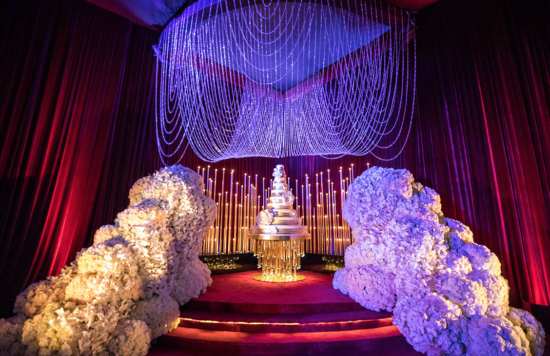 Guests arrived at the ceremony area via a red carpet lined with opulent floral decor. 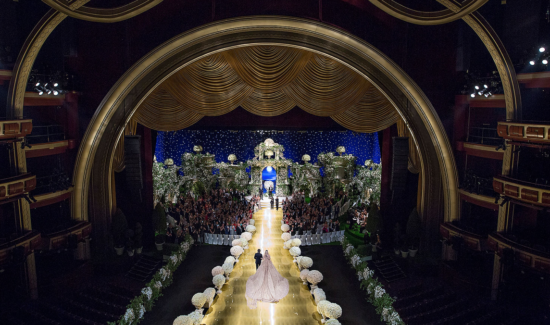 After everyone found their seats on the stage, the ceremony began with a stunning reveal of the couple. At the farthest end of the long aisle, heavy red velvet curtains opened. 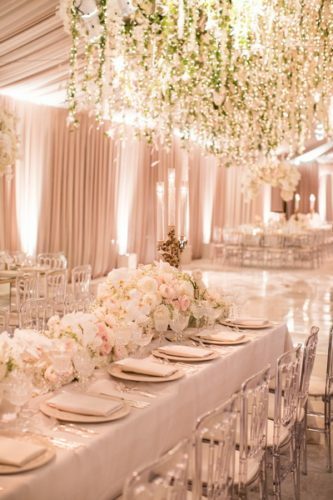 At this point, the wedding lighting in the room dimmed, the strings began to play, and the lighting illuminated the bride as she walks down a golden runway. 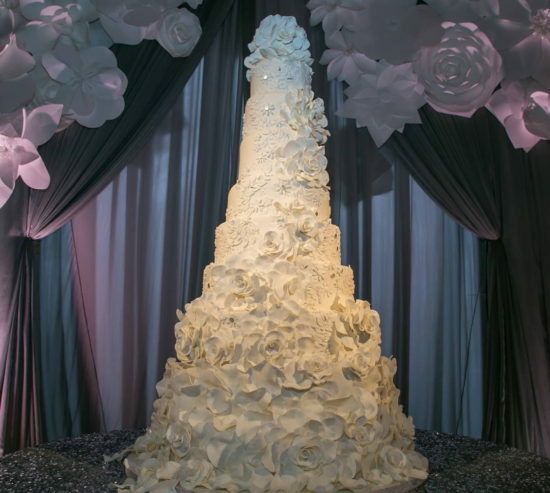 It stayed with her as she walked toward a ceremonial altar designed with a huge arch festooned with white flowers and gold accents. During the ceremony the wedding lighting remained focused brighter on the altar area. As they exited, the lighting once again followed them, dimming as they left the room. 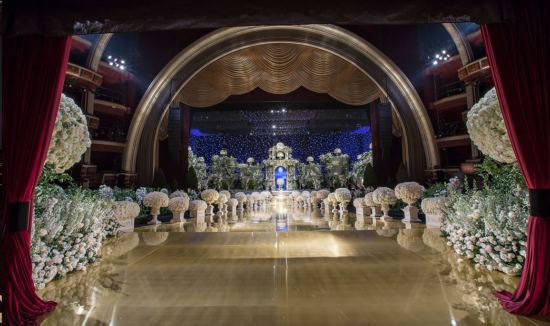 The reception in the ballroom of the theater was just as jaw dropping as the ceremony. 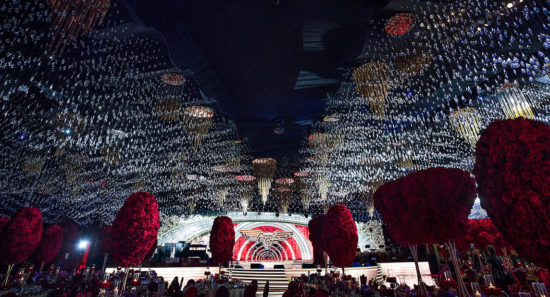 It was marked with huge centerpiece of red roses, a ceiling of crystals and crystal chandeliers, a stunning custom stage on which Lady Gaga and Jason Derulo would perform and ballet dancers on smaller stages performing among the guest seating. For a lighting designer, working at the Dolby Theatre is a dream. 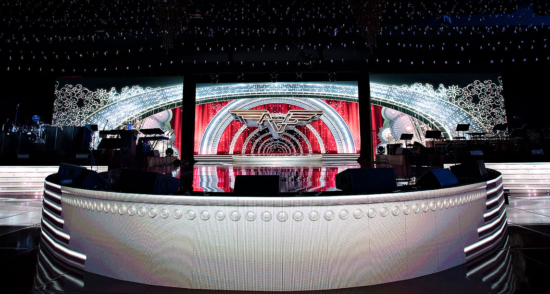 Its extensive truss structure and preset fixtures for the Oscars enable us to do sophisticated lighting effects. 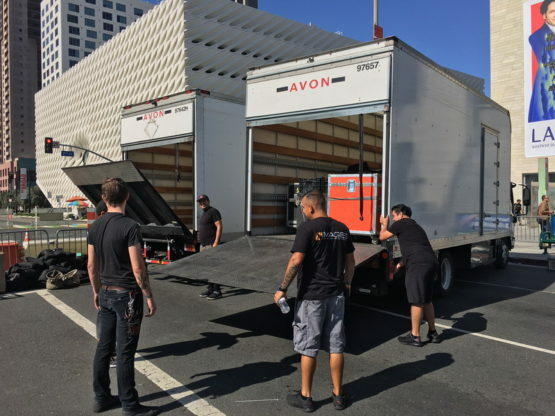 Even so, it still requires huge hours of precise planning and a large, experienced, professional team. In this case, those hours were put in by our senior lighting designer Ray Thompson. 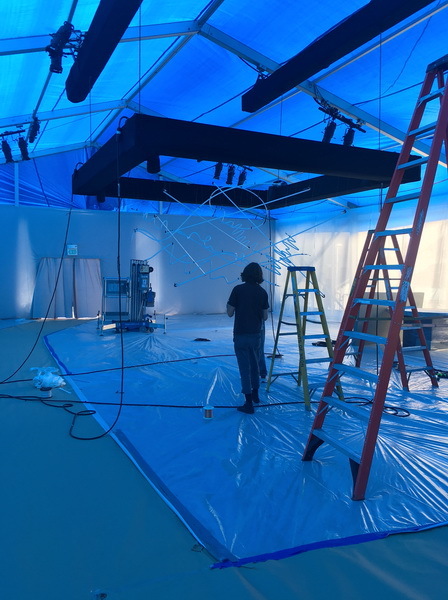 After the initial design was done, he assembled and oversaw a team of union members, technical directors and master electricians, most of whom were on site for the full five days of setup. The results were sparkling! 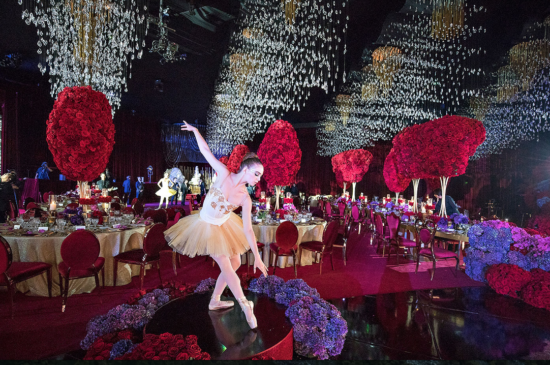 In addition to room and stage lighting, we also projected a leaf pattern on the huge rose centerpieces to add depth and shadow. And to make the crystals sparkle even more, we set up targeted lighting set in a slow wave motion. 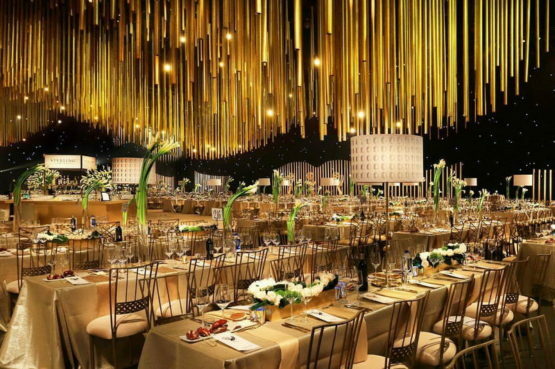 The entire room crackled with energy of light, love and high style at the wedding of the year! On a hot night in Los Angeles, winter was finally here. 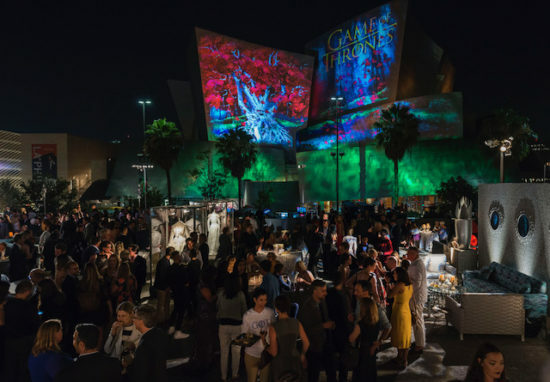 The city was lit up for the Game of Thrones premiere of Season Seven, what was in essence the beginning of the end of this popular HBO series. 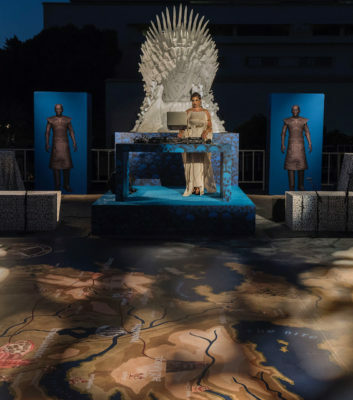 The tribe assembled was not only those who had walked frozen tundra to the Wall, flown dragons and battled for the throne, but those event professionals who have produced all the premiere events for the series. 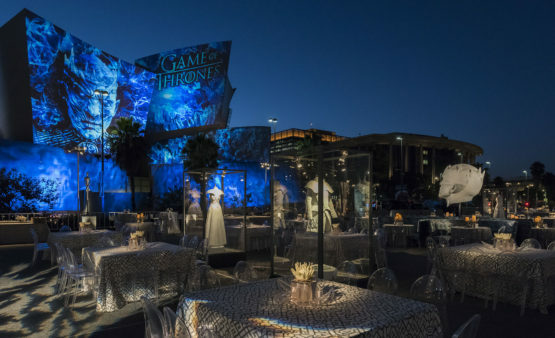 Over the years, this tribe, ie team, led by designer Billy Butchkavitz, has included video mapping by Bart Kresa Design, lighting by Images by Lighting, rentals by Town and Country Event Rentals, and design works such as frozen thrones to vinyl wrapping by Agile Eye Solutions. And this year, projection and engineering by WorldStage in partnership with Panasonic was involved. In years’ past, the event has been held at the San Francisco City Hall and the Hollywood Roosevelt Hotel. This year it was held at the Walt Disney Concert Hall. 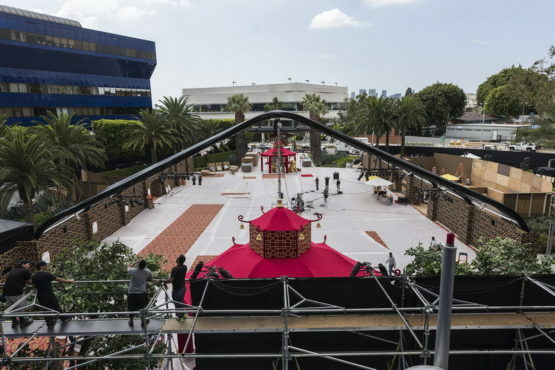 After viewing “Dragonstone,” the first episode in Season Seven, the attendees, a star-studded guest list, made their way across the street to the rooftop of a parking garage that had been transformed into another world, or rather, the many worlds of Game of Thrones. 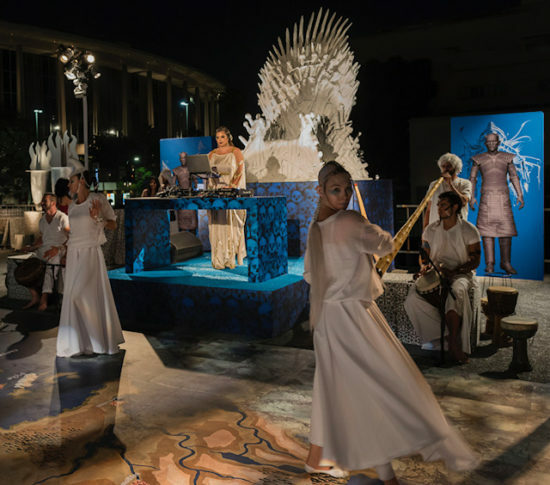 It was populated with some White Walker-esque creatures, Night Kings, and ghost-like characters from the episodes in the form of art installations. Working from sketches from Game of Thrones costume designer, Michele Clapton, Agile Eye created replicas in paper! 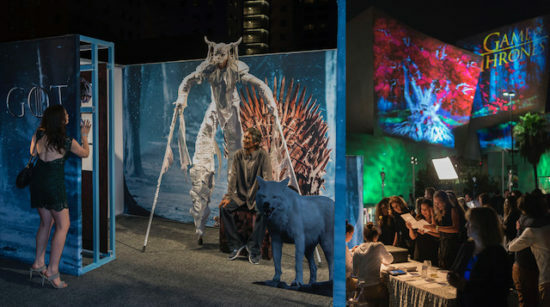 Our lighting highlighted these installations and other elements such as the larger-than-life bust of the Night King, lounge settings and 3D photo opportunities. Overlooking all of this was a video projection by Bart Kresa that captured the imagination of the event goers, and the attention of the worldwide press. 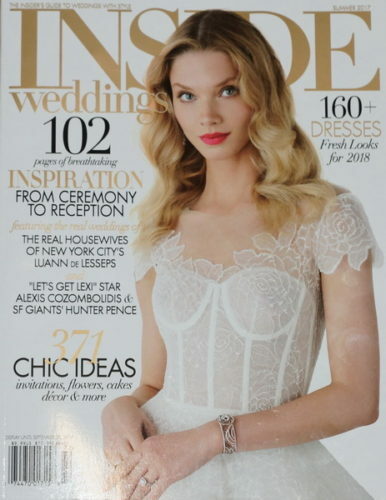 Featured in Special Events magazine. 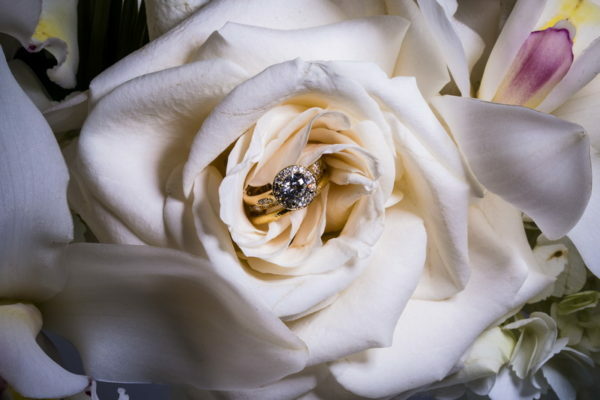 Wedding Lighting: Set to Stun! 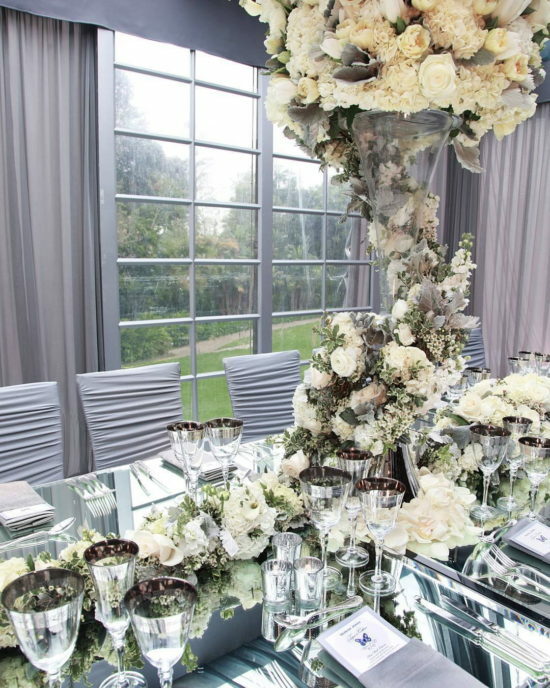 A truly stunning and modern wedding design for a wedding at The Huntington Library. 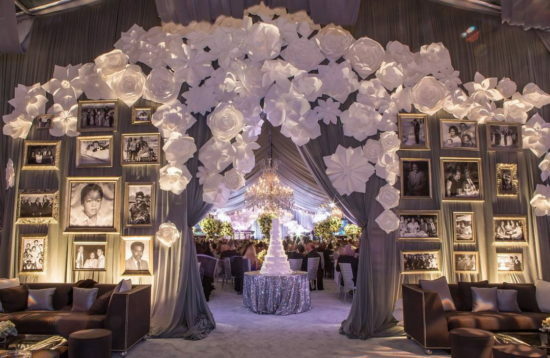 The monochromatic color palette is a favorite for us, as the drama of lighting really shows up. We also love showing daytime photos (below) to illustrate the drama that lighting can have. 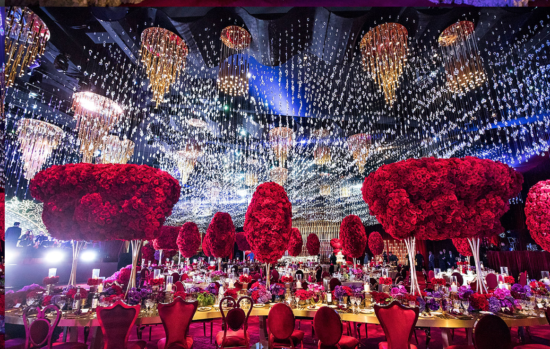 No matter what, International Event Company and this team of event professionals set this wedding decor, and its wedding lighting, to STUN! 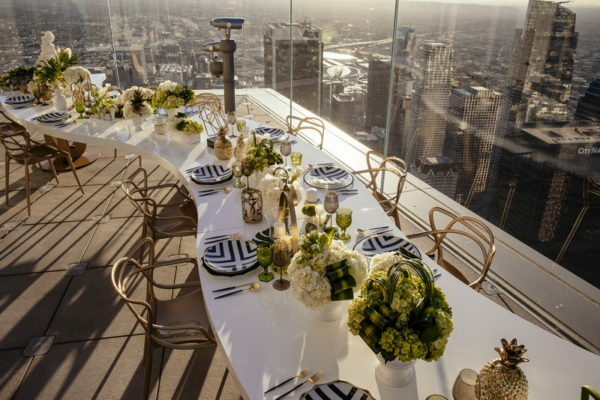 A recent photo shoot we were part of at OUE Skyspace enabled our team took Los Angeles event lighting to new heights, literally. 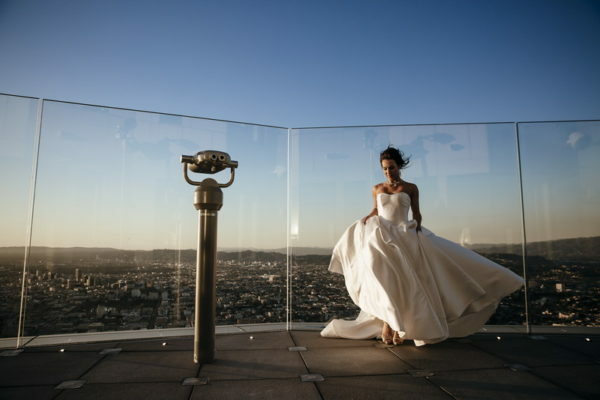 The site’s tallest open-air observation deck, 1,000 feet above the skyline, offers a dramatic 360-degree scenic view of the sprawling downtown area. 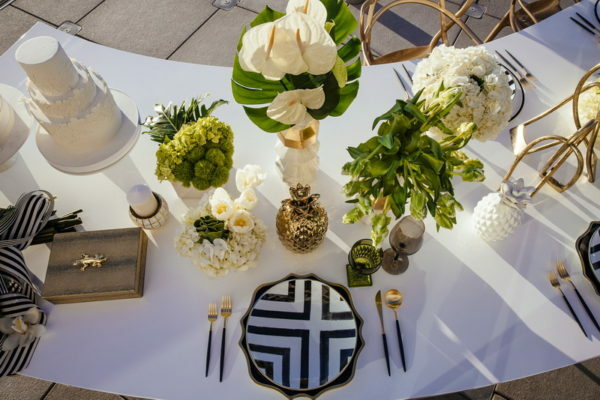 We worked with Aquafuzion Event Planning and Floral, Revelry Event Designers and Casa de Perrin to transform the space into a modern oasis showcasing this wedding season’s top trends such as the use of greenery, Pantone’s 2017 color of the year. 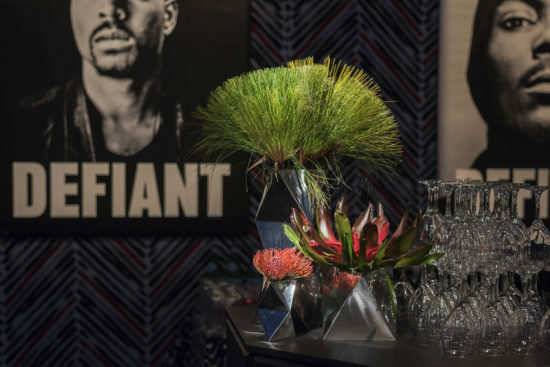 This was seen from the contemporary floral arrangements crafted by Aquafuzion to the modern vintage Casa de Perrin stemware. 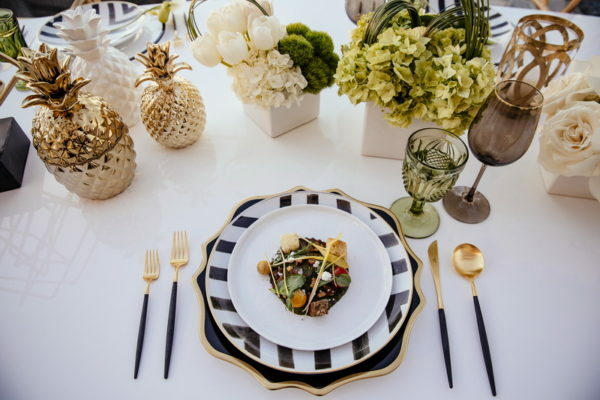 Metallic accents are also a trend, and that was illustrated by the Amsterdam chairs from Revelry Event Designers and the whimsical pineapple centerpieces. 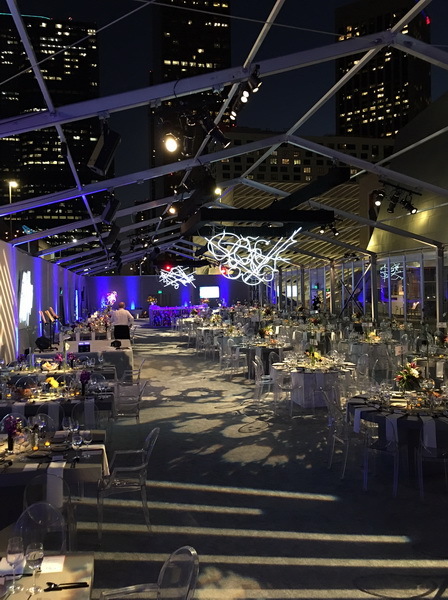 Our lighting designer Nicholas Blasi perfectly framed the serpentine white dinner table at the center of the scene downtown Los Angeles glittered in the background. 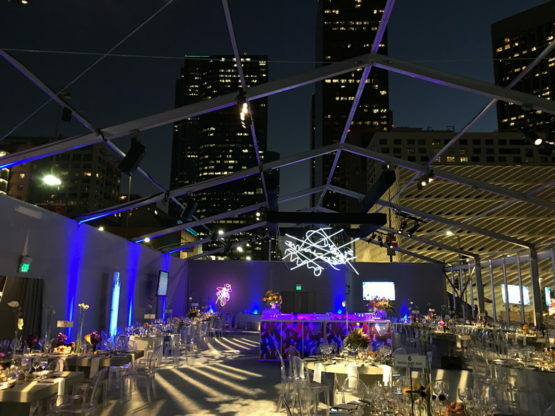 High style for Los Angeles event lighting indeed! Premiere lighting is an art. 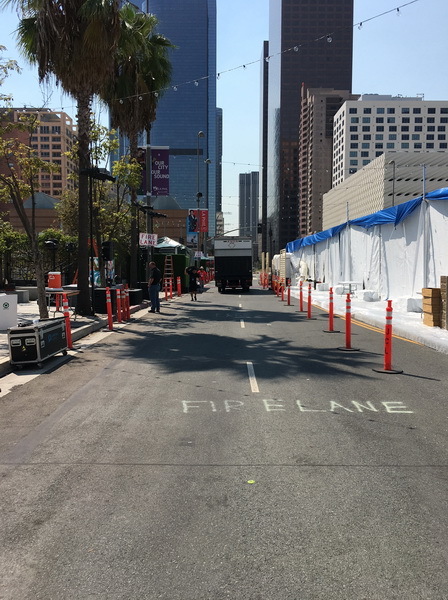 In addition to the red carpet arrival lighting — creating an even, camera-ready lighting for the step-and-repeat outside the event, we also light promotional artwork throughout a premiere event, as well as the event itself, of course. 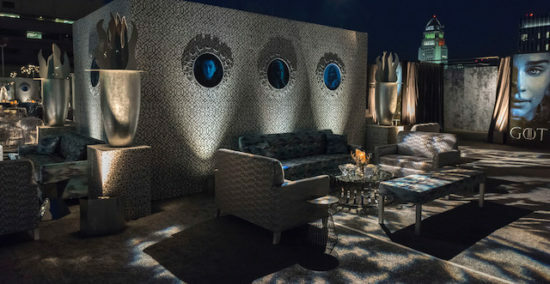 The ambient lighting has to reflect the style of the movie, show, or play, and be moody enough to make the Hollywood crowd look great and feel comfortable. 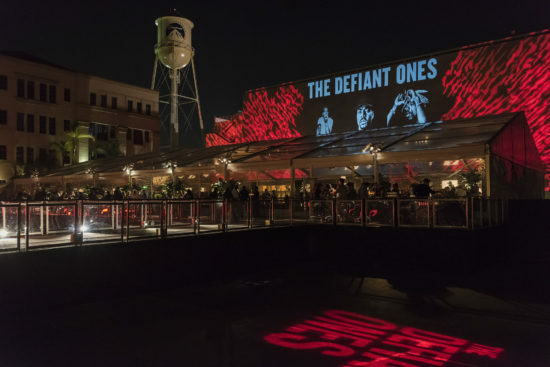 Such was the case of our premiere lighting for HBO’s new documentary, The Defiant Ones. The series focuses on Dr. Dre and Jimmy Iovine, two powerful and iconoclastic music producers. 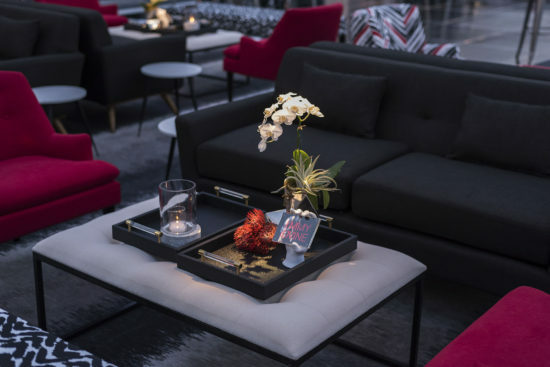 The design by Billy Butchkavitz in black, white and red, featured custom carpeting and upholstery for the furnishings. 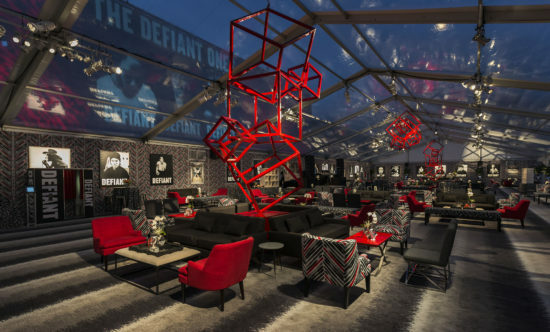 Bright red chairs, and asymmetrical sculptures placed throughout the clear top tent at Paramount Studios added pops of color drama. 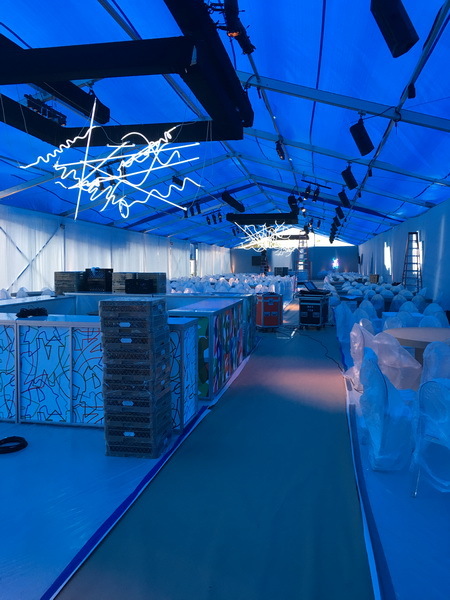 A huge projection of the title and the characters by Bart Kresa Design could be seen as guests walked up to the event, as well as through the tent itself. 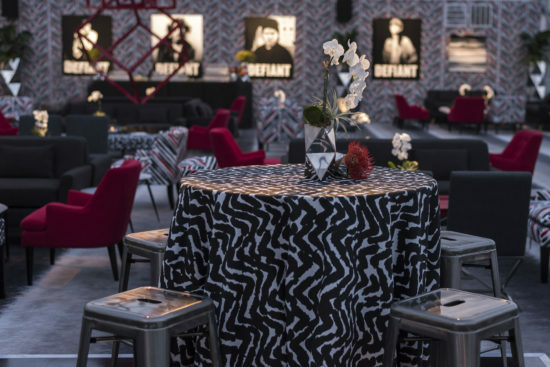 And although our lighting was as big and bold as the event design, in the seating areas, where people actually spend the most time, our lighting became subtle and nuanced to match Billy’s decor. 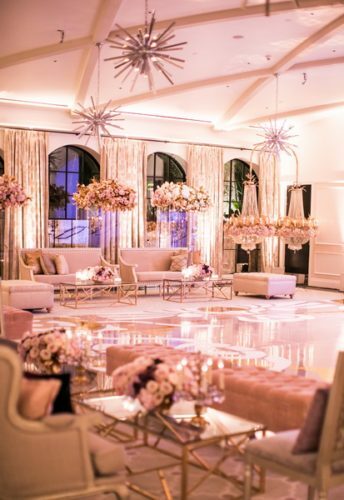 Just a kiss of light on the protea and orchids on central ottomans was all that was needed to highlight their beauty. Now that’s an art! The four-part documentary begins July 9.